Modern digital components can run quite hot, especially satellite receivers and DVRs like TiVo units. But the enemy of long equipment life and best performance is heat - every 10� above 85� reduces life by 40%. The Dual-Mode Component Cooler can be placed below a unit and blow cool air up into the air inlets on the bottom of the chassis. Or you may easily reverse the rotation of the fans and place the Component Cooler above a heat producer, extracting hot air out the top of the component. The Dual-Mode Component Cooler supports up to 100 pounds, so feel free to load it with your heaviest amplifier. 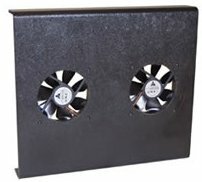 The twin 120mm fans are running on less than their rated 12 volts so are extremely quiet at their normal speed. Even when the thermal switch triggers the higher fan speed at 90� F, the fans operate at only 20dbA and move 30cfm. Note that the Dual-Mode Component Cooler will not benefit equipment inside a closed cabinet, as it would merely recirculate heated air. You need a system to extract hot air from a closed cabinet. The Dual-Mode Component Cooler is shipped in �Shelf� configuration; it can be placed on top of a hot component which has ventilation openings in its top cover and will cool it while providing a shelf to support a second component. The second component is shielded from the heat generated by the lower component, allowing more equipment to be placed on a shelf or within a bookcase. Simply place the cooler on the lower (hot) component, then place the preamp, CD player, or other component on top of the Dual-Mode Component Cooler. When changed to �Base� configuration, it can be placed beneath a satellite receiver, DVR/PVR, amplifier, receiver or any other heat-producing device which has ventilation openings on the bottom surface. Its quiet fans are powerful enough to force a gentle stream of air up through the receiver and out the openings, providing a substantial cooling effect.